Tokyo (VNA) – The Philippines and Japan have agreed to bolster national defence ties through joint training activities and defence equipment collaboration within their strategic partnership. 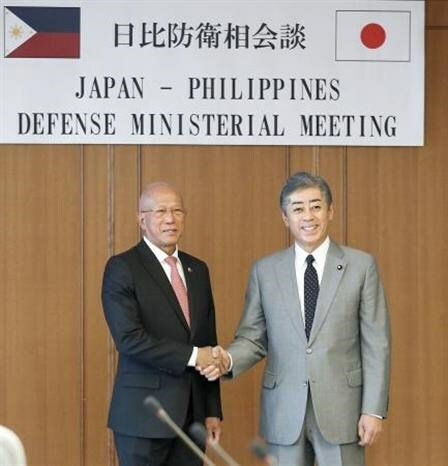 During talks with Philippine Secretary of National Defence Delfin Lorenzana on April 17, Minister of Defence of Japan Takeshi Iwaya said the bilateral defence cooperation has been strengthened in various fields, adding that Japan looks to support the Philippines in natural disaster relief work and improvement of the early warning system for the Southeast Asian nation. In reply, Lorenzana, who is paying a visit to Japan, voiced his hope that the two countries will further strengthen the strategic partnership as Japan is about to have a new emperor. At the talks, the two defence officials agreed to continue the participation of the Japan Self-Defence Forces and the Philippine military forces in joint exercises with the US armed forces in the East Sea. Meanwhile, Japan will provide technical support and defence equipment for the Philippines, as well as facilitate its armed forces to enhance capacity of naval, ground and air forces.